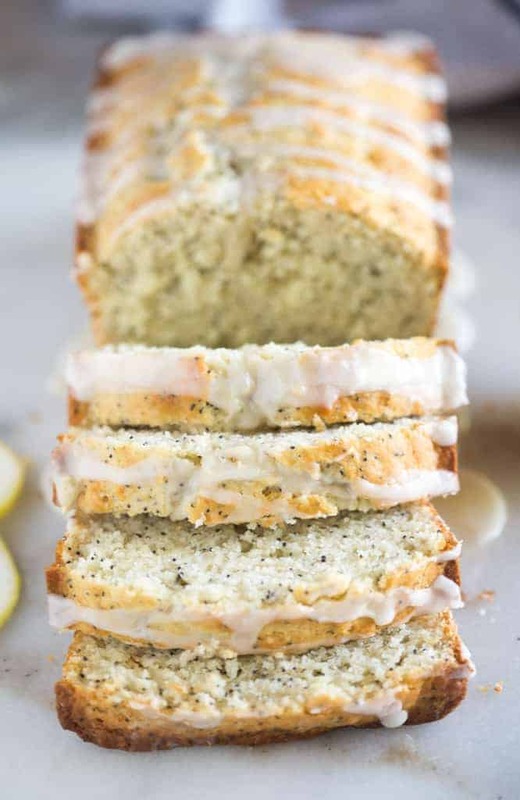 Lemon Poppy Seed Bread with a sweet lemon orange glaze is one of my favorite easy quick bread recipes. This is a great recipe for breakfast or brunch with friends. It’s tender and moist. 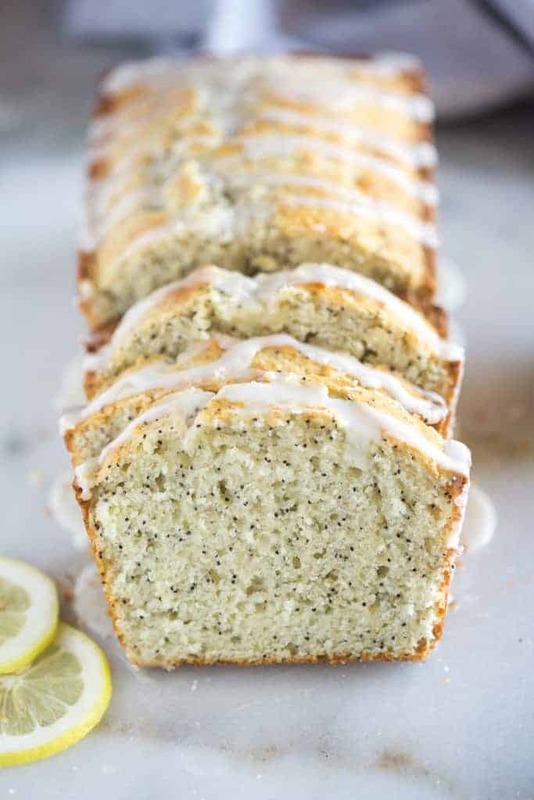 One of my friends brought me a loaf of this lemon poppy seed sweet bread when I got home from the hospital with my first newborn. I can honestly admit that I devoured the entire loaf by myself and I didn’t even feel bad about it! (I blamed it on the fact that I was extra hungry from nursing my baby boy :-). It tasted SO good, and now it’s one of those foods that always brings back the best memories of those first few days with a new baby. The original recipe is from here, but my friend had omitted some unnecessary ingredients and added a lemon flavor. This new version is terrific! Mix The dry and wet ingredients together in separate bowls. Then gently stir them together, just until combined. 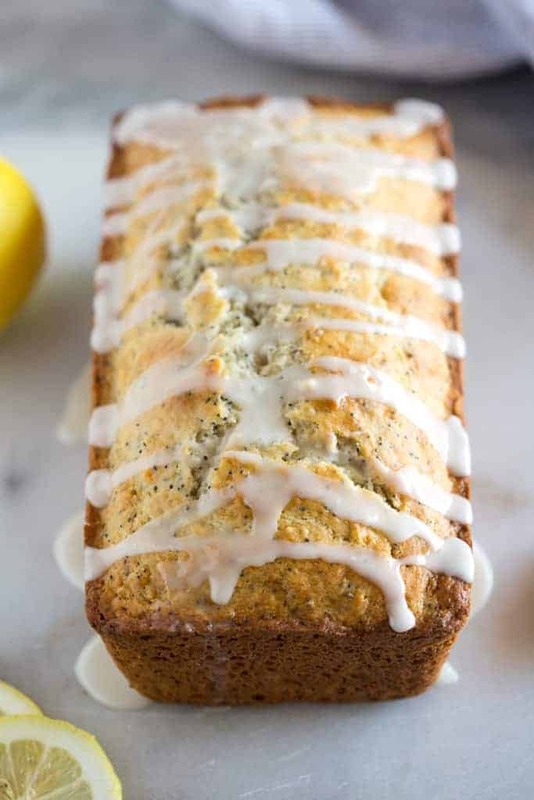 Pour the batter into two 9 inch loaf pans that have been lined with wax paper or parchment paper, and the sides of the pan sprayed lightly with cooking spray. Bake for 50 minutes – 1 hour, or until a toothpick inserted comes out clean. Cool for 5 minutes in the pan before inverting the loaves onto a wire cooling rack. Make the glaze by combining the powdered sugar, lemon and orange juice, and vanilla. Drizzle the glaze over the warm bread. 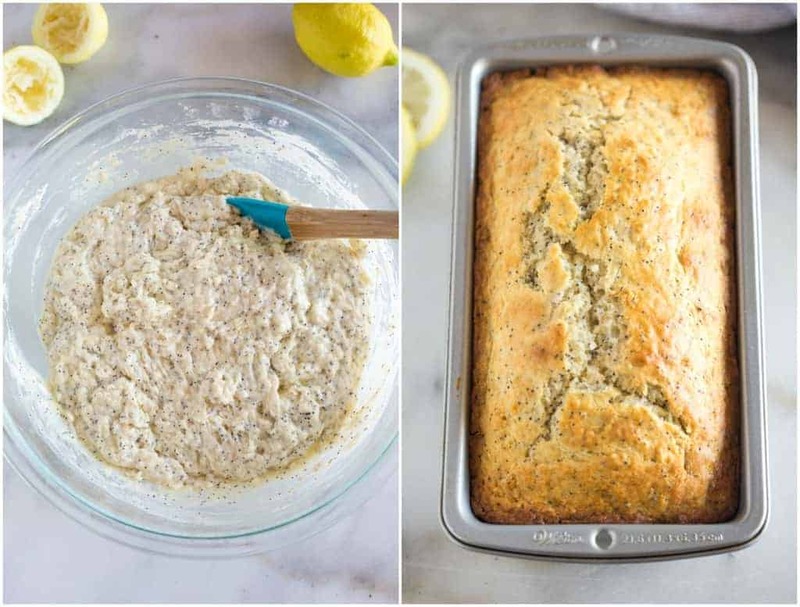 This recipe makes 2 loaves, so it’s perfect for sharing with a friend, just as mine did with me. You could also freeze the other loaf in a freezer ziplock bag. Allow the bread to come to room temperature before cutting. 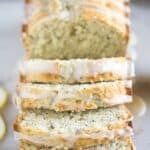 Lemon Poppy Seed Bread with a sweet lemon orange glaze is one of my favorite easy quick bread recipes. Preheat oven to 350 degrees F . Line the bottom of two 9-inch loaf pans with a piece of parchment or wax paper. Spray the sides of the pan lightly with cooking spray. Mix together flour, salt, baking powder and poppy seeds. In a separate bowl mix together the sugar, milk, eggs, lemon juice, lemon zest, oil, and vanilla. Add the wet ingredients and stir until just combined. Divide batter evenly between the prepared pans. Bake for 50 minutes - 1 hour, or until a toothpick inserted into the center of the loaf comes out clean. Cool for 5 minutes before inverting onto a wire rack. Mix orange juice, lemon juice and vanilla extract. Add enough powdered sugar to make a glaze. *I first shared this recipe in June 2013. Updated August 2018. I make this bread every Christmas for family and friends and they love it! The only thing I do differently is omit the almond extract and use only the lemon extract in the bread. This doesn’t have almond extract stated in the recipe. What adjustments would I need to make for high altitude in this recipe? I live at 5,000+ feet. You could add an extra tablespoon or two of flour 🙂 enjoy! Can you freeze this loaf glazed? If I were to freeze the poppyseed bread, would I put the glaze on then freeze, or defrost, then glaze. You can put glaze on before freezing! Make sure your glaze is a little more on the thick side! We made this for a bake sale fundraiser and the loaves sold for big money! They were delicious! I went a little heavy on the lemon zest, based on some reviews that it wasn’t lemony enough and the flavor was spot on. I was using the aluminum foil bread pans from the grocery store since we were wrapping them up to sell, and the baking time in those smaller pans was about 65 min to perfection. Making more now! Looks so good! Have you ever made it in smaller tin pans? Wondering what the cook time might be for that and if it would be fine that way! Thanks! Sure, you can use mini loaves! I’d check on them around 30 minutes.